Are you a fan of sport tourism? Are you looking for adventure, action and fun? 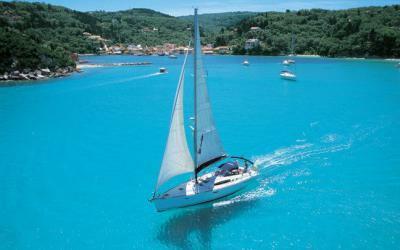 Lefkada through the wide range of activities its offers, will take you to new quests and experiences. 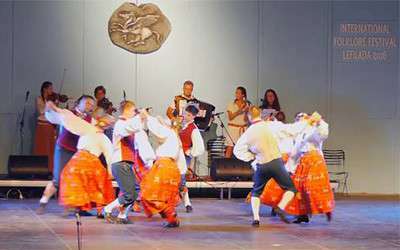 The natural environment of Lefkada provides the best location for these activities. Sailing lovers can discover many hidden beauties. 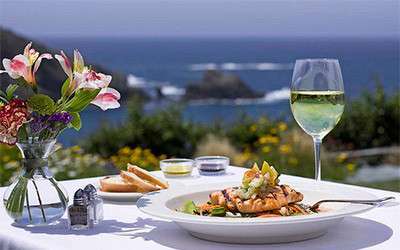 The images with the exotic landscapes you will discover and the beaches you can enjoy compete with each other in charm. The modern marina in the city of Lefkada has paved the way for more visitors as it has a capacity of 620 seats. 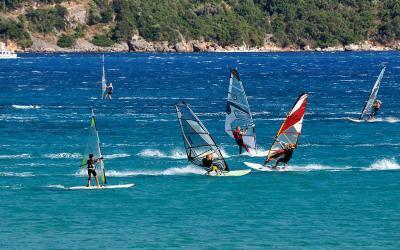 Magnificent coastlines and ideal weather conditions make Lefkada a number one destination for windsurfing enthusiasts. Vasiliki beach is among the 10 best in the world and the 3 best in Europe for this sport. Also an ideal beach is Ag.Giannis which is sure to offer you a unique experience. 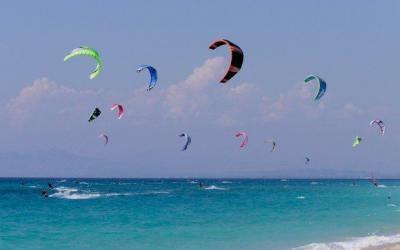 More and more people travel to Lefkada every year to enjoy their favorite sport on the beach of Ag. Giannis, overlooking the enchanting landscape of the windmills. If you are a beginner it will take you just 3 hours with a trainer to surf. The favorable winds which blow all year will give you great emotions. And while the wind is taking care of you its earthly beauty, an underwater world full of secrets and surprises awaits you to explore it. 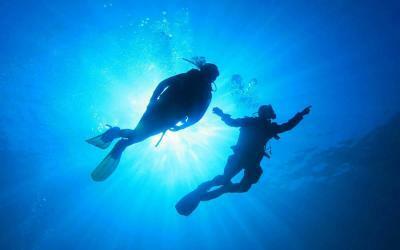 The sub-marine wealth of Lefkada with thousands of fish and sea life will take you to their mysterious world. 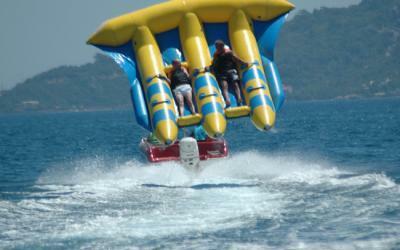 Have fun with the family or friends by choosing to ride inflatable games (fly-fish, crazy-sofa, banana, tubes, etc.) will offer you unique moments of laughter. Choose to fly parasailing enjoying the bird eye view of the Princess islands and the cosmopolitan Nydri. Those who love water sports can try their skills at water skiing, wake-boarding or barefoot skiing. 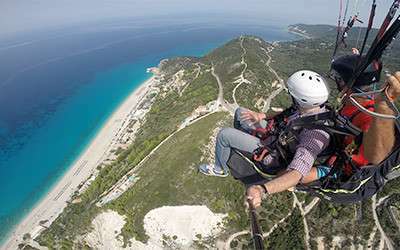 Lefkada leaves no one unmotivated, even the least daring. 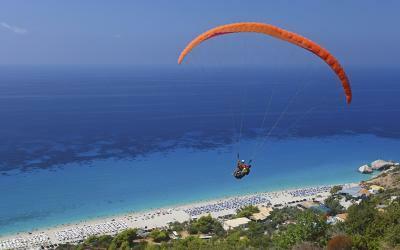 Want to feel the adrenaline flying over the skyline, the green and the immense blue of the Ionian Sea. A paragliding flight will fascinate you and will remain unforgettable. Lefkada is not just beaches, sea and sun, hides many surprises to explore. 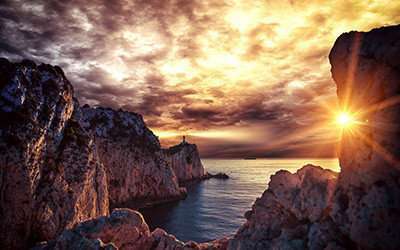 Follow the paths and tour the gorges, ravines, springs, waterfalls scenery of amazing beauty and spots with spectacular views of the Ionian Sea that will leave you in awe. 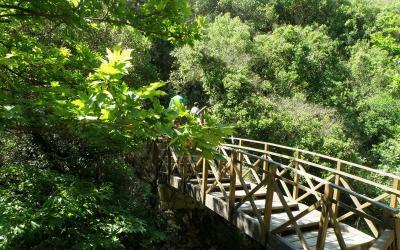 Mountainous Lefkada is ideal for walks, treks and nature excursions. 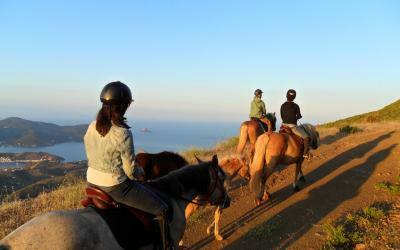 Horse riding enthusiasts can enjoy the mountain and the sea side by side with your favorite animal by riding it on a wonderful trip. Experience the world of riding by having your first lesson, or if you are experienced enjoy a ride on the beautiful paths. 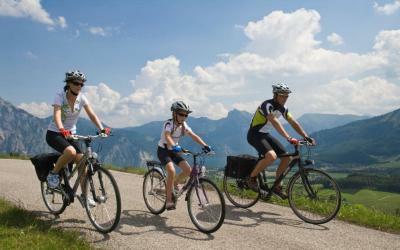 Explore and discover the sights of the island by cycling. Whichever route you choose will have something to offer you. Wander through the green mountains, enjoying nature, picturesque villages and the view from above. Biking while the sun set is around the beautiful Gyra lagoon, will reward you with the most beautiful spectacle. As Lefkada is a traditional fishing island in the Ionian Sea, lovers of fishing have the opportunity to enjoy your favorite hobby in traditional harbors, beautiful beaches or somewhere in the open sea by boat. 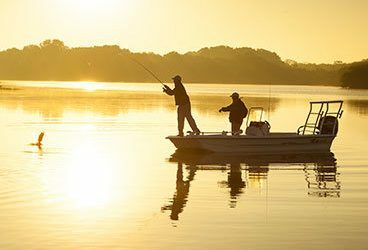 If you are a beginner and want to feel the experience, get to know fishing by the side of a professional.